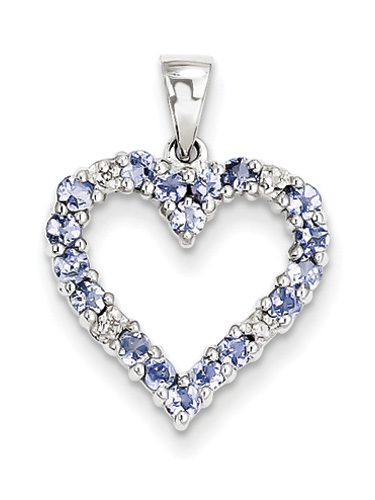 Real tanzanite gemstones are prong-set in this adorable heart pendant with 3 small diamond accents crafted in .925 sterling silver. Makes for a perfect romantic gift or just because! Heart measures 5/8" across by 7/8" tall with hoop/bale. Sterling silver box chain (optional). Pendant weighs approx. 1.44 grams. Rhodium plated for shiny white look and long-lasting finish. We guarantee our Real Tanzanite and Diamond Heart Pendant, Sterling Silver to be high quality, authentic jewelry, as described above.